There are many situations where you might want to take screenshots of a webpage. Sure, there are browser extensions that do the job, but if you have to take screenshots of many web pages for archiving them, or generate them as part of an automated process, then you need a command line tool for the job. 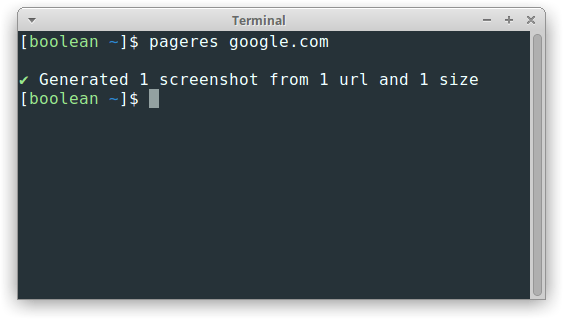 Here are four tools that generate web page screenshots from the command line. Although this is not as popular as some of the other, more well-known tools, pageres-cli is easily the best tool for generating screenshots. Based on PhantomJS, and written in Node.js, it renders even the most complex web pages accurately. This gives you a screenshot in your current working directory, named google.com-1366x768.png, which as you can tell, is in the resolution 1366×768 and in the PNG format. pageres google.com yahoo.com 1280x800 --format=jpg --filename="Pictures/<%= date %>_<%= url %>"
google.com and yahoo.com are the URLs whose screenshots will be generated. 1280x800 specifies the screen size in which the screenshot will be rendered. --format specifies that the format that will be used. In this case we used the JPG format. --filename specifies the directory where the screenshots will be stored and the format in which files will be named. In our case, we have specified that they should go into the “Pictures” directory, and the filenames should contain the date, followed by an underscore (_), and further followed by the URL. You can even specify different settings for different websites! There are a variety of other options available; have a look at the project’s homepage. Firefox 57 and later versions features a command-line screenshot mode. Just like pageres-cli, Firefox captures webpages accurately, but it doesn’t have as many features. This mode doesn’t make use of a graphical environment, which makes it well-suited for usage on servers. This creates a full-page screenshot of google.com to the file google.png. At present, Firefox doesn’t support creating screenshots in other formats. If you use a different extension like google.jpg, it will create a PNG file with that name. Addons installed in Firefox also affect the output; which is pretty useful in many cases. For example, if you install an ad blocking extension, this also removes ads in the screenshots. While pageres-cli and Firefox are great, they are not to everyone’s tastes. Fortunately, there are other tools like cutycapt. It uses the QtWebkit library for rendering web pages. On Ubuntu and Debian, you can install it with sudo apt install cutycapt; on other systems, you can compile it from source as described on their homepage. cutycapt will try to detect the format of the output file from the filename. JPG, GIF, SVG and PNG formats are supported, among many others. This will give you a screenshot of the resolution 1366×768. Have a look at the man page by typing in man cutycapt on the terminal to see a list of options. In the above command, the --server-args parameter simply creates a virtual screen buffer of size 1024×768 with a 24-bit color depth. It does not affect the screenshot in any way. wkhtmltoimage, which comes as part of wkhtmltopdf, is another tool to generate screenshots. Its feature set is oriented towards fast, automated generation of screenshots; although it is not the best if you want accurate ones. It should be available in your distribution’s repositories. On Debian/Ubuntu, you can get it with sudo apt install wkhtmltopdf. If it is not available on your distribution, you can always get the precompiled binaries or compile it from source. One word of caution though: if you are planning on running wkhtmltoimage on an environment without a X server, you should grab the precompiled binary — the ones in the default repositories often do not support running without it. In certain cases, the screenshot may have a greater width than what has been specified. You can fix this by adding the --disable-smart-width flag. The --custom-header-propagation switch ensures that the custom User-Agent HTTP header to fetch all resources, such as images, JS files and inline frame content. To view the full range of options available, run wkhtmltoimage --extended-help. In this article, we have seen how to take screenshots of webpages using a variety of tools — some of which are oriented towards accuracy, and others towards speed.